17:13:17 a2666 Test. Text. Look to the right. 19:30:31 a3281 Est-ce une Ã(c)mission pour les australiens ? 19:32:56 a3281 Penses-tu que les vaches puent ? ou les porcs ? 19:33:53 a3281 Est ce que tu penses que l'on peut apprendre Ã bouger les oreilles? 19:34:28 a3281 Who was Groucho Marx? 19:34:50 a3281 Sing a song then ! 19:35:50 a3281 Could you recite the alphabeth ? 19:37:13 a4451 Cover your eyes with your fingers. 19:38:19 a4451 sing a sad song without opening your mouth. 19:41:34 hen how do we see? 19:42:27 a3281 Is Jezus with you? Who was he anyway? 19:42:34 a Â" Les femmes sont comme le crocodile : pour attraper l'homme, elles pleurent ; une fois qu'il est pris, elles le dÃ(c)vorent. Â"
19:43:25 a3281 Are apricots to stay ? 19:49:30 a3281 Could you give us colour image? 19:50:21 scenophonie can you do sound with something on you.? 19:51:03 a3281 Could try to make music in concert with Igor? 19:51:04 a Sing the" marseillaise"
19:51:49 hen keep saying "two"
19:56:31 a3281 What will be the wheather forecast for Lille today ? 19:57:58 jules1984 tell me how you love igor? 19:32:14 i2825 Could you give me a sympathetic smile please? 19:33:21 i4735 Breath deeply. 19:33:25 i2825 What were you doing when Kennedy was shot? 19:34:16 chaud chaud ich bin eine grosse kartefeu! 19:36:20 i2825 What do you think about pedofilia in Africa? 19:36:45 i4735 close your eyes. 19:37:11 i2825 Are apricots to stay ? 19:43:10 i2825 Could you tell us a boyhood story? 19:45:51 i4735 ask: can we go on? 19:46:00 i2825 yeah a boyhood souvenir! 19:47:38 lucille can you tell a line of code? 19:51:17 i2825 Could try to make music in concert with Annie? 20:04:14 ibalia moi aussi une bière!!! 20:15:38 minibar where are you? 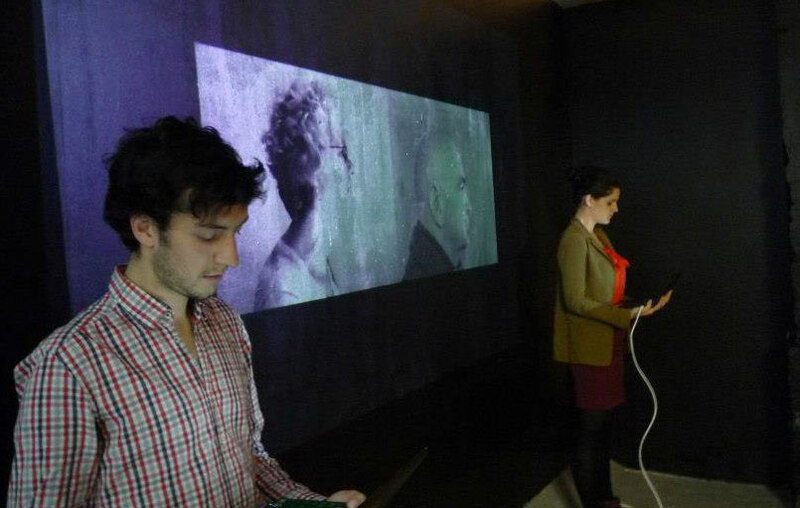 Igor and Annie will be united in a webcam performance interface. Their images projected together in front of a public that has acces via computers and smartphones to an URL where they can write text instructions for the performers. Igor and Annie will be the marionettes to be put into (e)motion via this text written by the public. Two speakers will read this text aloud in front of the public while Annie and Igor will execute as good as they can the protocol and commands proposed to them, they won’t kiss. No content determined. The performers are as instruments. There is no agency without commands. The public is the master of this game. This project tends them a mirror – a mirror for their capacity to co-write these events, to guide this intimate meeting of two internet puppets. External instructions from the public are activating internal structures of the performers, who are also too occupied by the execution of the instructions to consciously negotiate their presence, and so they're showing their vulnerabilities and doubts, their messy and sloppy sides, their "hidden code" and are going beyond self-representation* and the control that this requires. 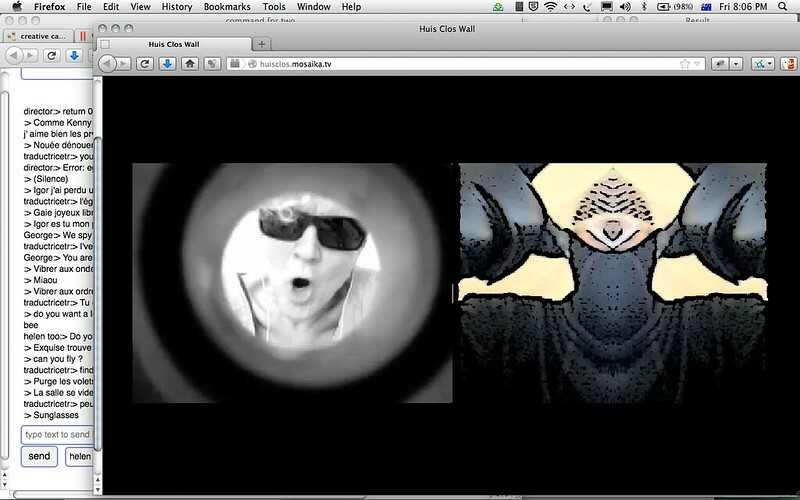 *see "Trapped to Reveal – On webcam mediated communication and collaboration" An exposition concerning my collaborative webcam performance projects, focussing on / trying to determine the special aspects of machine mediated communication and collaboration, published in the Journal for Artistic Research. As much an exercice in collectif writing as a performance. 21/02/2014 19h45 CET, festival Tropisme, la Panacée, Montpellier. Annie and Igor will be your avatars. To command them go to http://bram.org/command at 19h45 on the 21st. You can watch Laurie Bellanca reading the commands aloud in front of a projection of the livestream before the public at la Panacée via le site de la gaite-lyrique.net. We admit : We had difficulties acting as puppets - we became active agents. "one performance, two personalities, two approaches, one piece" Annie and Igor both made a video mix of the screencapture of the performance. More performance images on flickr. Commands see at the left. Readers in front of the projection at Show Off. Event related to E-literature in/with Performance, an Electronic Literature as a Model of Creativity in Practice (ELMCIP) Seminar hosted by the University College Falmouth.